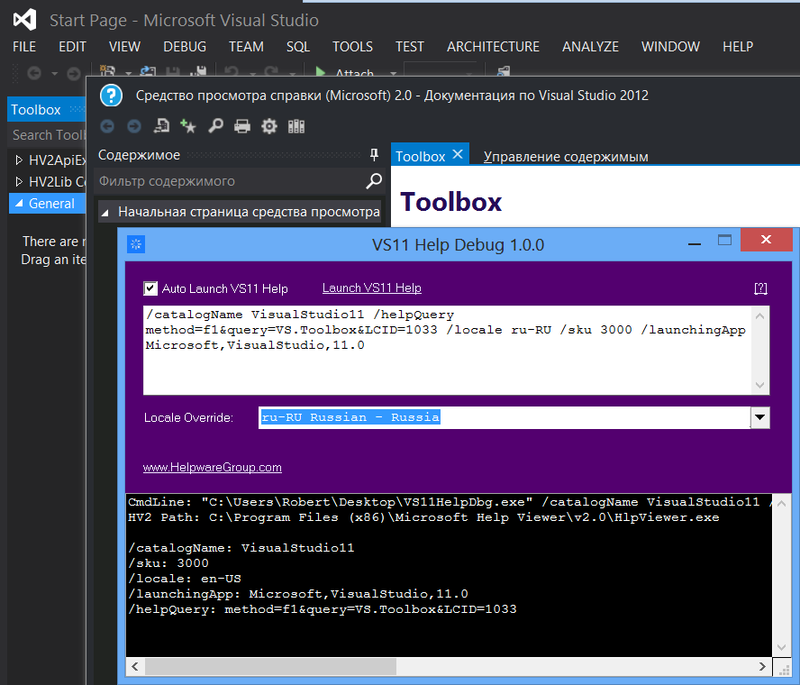 VS 2012 language Packs allow you to view VS and it's help in a foreign language. This is fine but developers often want to view VS UI in their own language and test foreign language help. I've achieved this by writing a small executable that sits between VS 11 and the help. As always thanks to the MS guys (Paul O'Rear, Jason Campbell and Malcolm Dickson) for taking time out to help me on this community project! This is free to download. All you do is run the application and next time you run VS 11 and press F1, help will now call the debug app instead of VS Help and display the command line sent. Check "Auto Launch" to continue to open VS help or click "Launch VS11 Help" to manually launch help (using the displayed command line passed to us by VS11). Use the "Locale Override" to modify the locale. In the example below I have VS English UI installed. When I press F1 the debug app displays the command line. I've select locale Russian so help will be displayed in Russian. And that's it. Now you can have VS11 in one language while displaying Help in another language. Close the debug application and restart VS11, and now F1 works normally again. The bottom panel just shows some debug (command line parsed etc). Hope you find it useful. If you do drop me a line. A zip file contaning the EXE is attached to the end of this post.